This rather unassuming species is native to the deserts of North America, hence the Latin name (nevadensis should make you think of the US state Nevada). 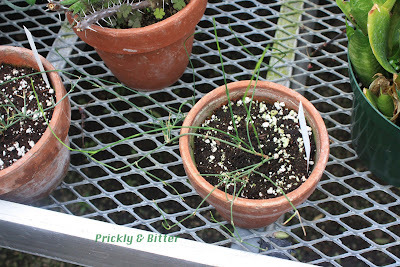 In a pot it grows to be a rather sad, straggly, sticky thing but in the wild it can be quite large, shrubby, and an important food source for many animals that live there. To me, this is one of the most fascinating plants in the greenhouse, right up there with whisk ferns (which don't look like ferns at all; you can read about them HERE). Ephedra, also sometimes called a gnetophyte depending on the species, is actually a closer relative to ginkgo trees (read about them HERE) and pine trees (read about white pine HERE) than flowering plants, or even club mosses (which it can look very similar to if you use your imagination). In the second image you can see some primitive cones if you look closely, and these are where the pollen and the ovules are produced to make new seeds. They are produced in the stem nodes, usually after new growth has appeared for that year. When a plant undergoes nodal growth, it will produce a bit of a branch and then once conditions are no longer favourable for growth it will produce a terminal bud. This bud will develop once conditions are favourable again and produce new growth and the bud scales will fall off, leaving a scar around the branch or stem which is called a node. This node is also where axial buds are produced, which end up growing into branches (or, in this case, cones). 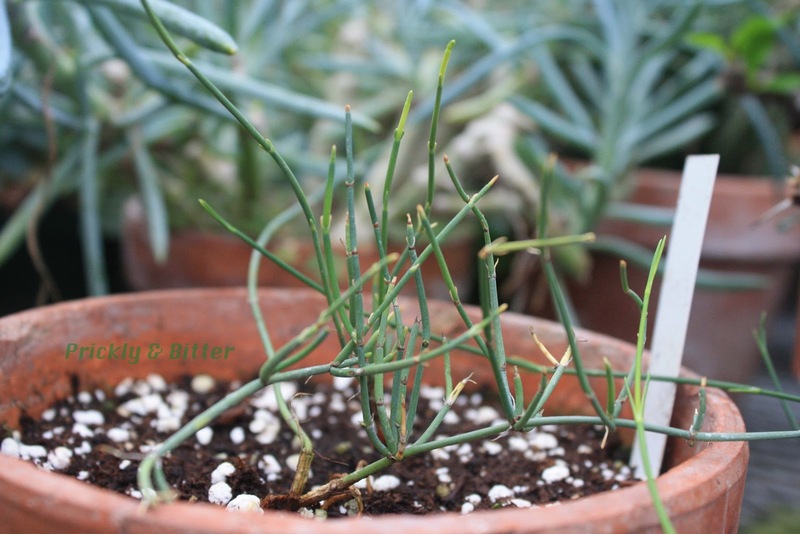 North American ephedra has been used for centuries as a medicinal species by Native North Americans, and also as a food (although, I can't imagine it being very tasty or very nutritious). For farmers historically and currently in the southern United States desert areas, it is also a very important forage crop for cows, pigs, sheep, and goats. Medicinally, this is not the same species as the psychoactive plant from which we get the drug ephedrine (but this is also a species of Ephedra, hence the name of the alkaloid). It was originally included in cold and flu medication because it is effective in drying mucous membranes (and so helping with your runny nose), soothing sore throats, and helping you sleep. There are other drugs that are now included in cold medication instead, because of the dirty little secret that ephedrine has. It causes a drastic increase in heart rate, which can have serious complications in some patients (especially those who already have high heart rate as a result of high blood pressure, or vice versa) and even death. In 2007 there was a huge spike in ephedra-related deaths in the United States, and so it was required by cold and flu medication manufacturers to remove products containing ephedrine and pseudoephedrine off the shelves. High-performance athletes were also rumored to use ephedrine as a performance-enhancing drug. Recreationally, ephedrine is a precursor in the manufacture of methamphetamine, and so the sale of ephedrine-containing products was fuelling the underground (and illicit) drug market. There was the suggestion that because ephedrine was such an effective cold and flu medication that it should be a medication you need to request from a pharmacist (but could get without a prescription) in order to obtain, but that wouldn't necessarily stop the ease at which methamphetamine manufacturing labs could obtain it. It has also been used as a diet aid (along with other drugs like caffeine) because it increases body temperature and so should help burn more calories per hour when sedentary, but aside from being incredibly dangerous (death or severe illness requiring hospital stays have been reported in several hundred cases), it also doesn't actually do anything. Only a minor increase in fat burned over a placebo was ever recorded in scientific studies, and certainly not enough to warrant it being sold as a diet aid.